PICAZO Vineyards invites you to join The List. Now you will learn about new and limited production releases, invitations to Private Cellar member-only events such as a private winery tour and barrel tasting and more! As you know, our philosophy is to grow the highest quality fruit from our vineyard and produce world class wine from our estate. It is our great pleasure to share this expression from PICAZO Vineyards with family and friends. In vino, salute, felicita', vita ed amore! Join The List Now, or Members Log-in to view status. 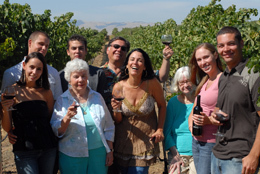 Based on allocation availability you may or may not receive an invitation to join PICAZO Vineyards Private Cellar. When allocations are available you will receive notification indicating that you have been enrolled in PICAZO Vineyards Private Cellar and may purchase your wine allocation. We have applied to other states that require wine shipping permits. Please call for current information if your state is not listed here.